The 2004 FEIS/EIR-approved design for the DTX includes a connection between the underground tracks in Second Street and the train box below the Transit Center (referred to as the “throat structure”). 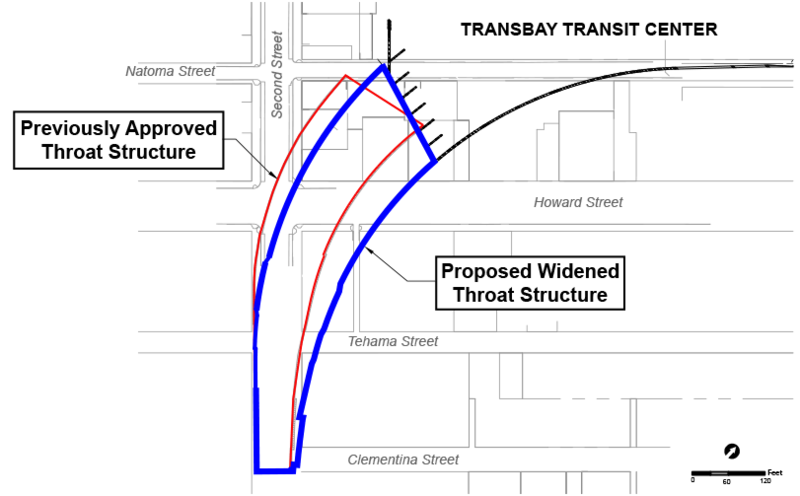 Existing development constrains where the throat structure alignment must widen from the three-track tunnel in Second Street to six tracks entering the west end of the Transit Center, and the width of the alignment depends on the curvature of the tracks. The previously approved design has a curvature radius of less than 545 feet. The proposed Widened Throat Structure calls for a 650-foot radius curve, which has been approved by the California High-Speed Rail Authority.